The Global Sun Oven® is the world’s most widely used solar oven. Solar cooking has been around for centuries, but up to now, not many people have had the opportunity to try cooking with the sun. 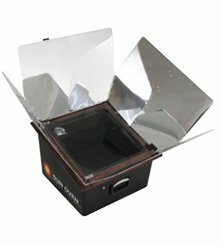 Using the most advanced materials, the Sun Oven takes all the hassles out of solar cooking to create the ultimate solar appliance. Measures 19” x 19” with an average depth of 11”. The total weight is only 21 pounds. You can bake bread, make cookies, pizza, muffins, or anything you could prepare using a conventional oven. Sundance Solar is proud to carry this high quality solar appliance that is designed to last a lifetime.